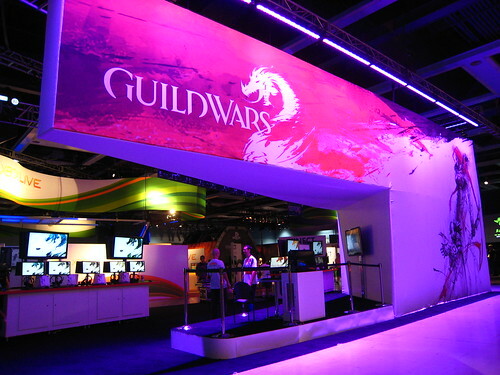 I spent the vast majority of PAX 2011 working, but I was able to get a bit of time off on Sunday to take a look around the Exhibit Hall to scope out the games I’m excited about. The first of these games is UNCHARTED 3: Drake’s Deception. All I really got to see was the booth, as the playable demos were all multi-player, and I’m not particularly interested in multi-player unless it is with friends. It’s a neat booth though. It was made to resemble a part of an airplane. My partner did get me an UNCHARTED 3 bag, which they were handing out, though. There’s another game on one side of the bag, and I don’t envision using this, so I’m thinking about cutting the bag up and putting the UNCHARTED 3 promotional image somewhere in my work space at the office. I’m definitely buying the Collector’s Edition. Check out this awesome unboxing video hosted by none other than Nathan Drake himself, voice actor, Nolan North. I stopped by and watch people play Just Dance and Dance Central at the Ubisoft and Microsoft booths, respectively, but I did not participate. We’re probably going to finally get an Xbox 360 and for my part it’s because Dance Central looks like so much fun. I’ll just figure out how to make the space issue in my flat work with the Kinect. The other 360-exclusive games have not been system sellers to me thus far. The one game that I actually got to see properly was The Secret World at the Funcom booth. I haven’t had a lot of time to follow all of their viral and ARG activities this year, but I’m still keen on this MMO game. The modern fantasy setting is what most interests me, along with a game that has no levels and no classes. They compared their skill system to Magic: The Gathering, which I thought was interesting as the skill system of original Guild Wars was often compared to the deck-building and card/skill c0llecting of M:TG. The developers ran through the first dungeon in The Secret World and talked through their design goals for the dungeon as members of the dev team played, which was interesting. I had a lot of fun during PAX, despite all the stress of managing ArenaNet’s events and booth staff (who numbered over 100). I enjoy planning convention events, seeing those events in execution, and dealing with all the unpredictable things that inevitably happen at conventions. If you do get a 360, Amazon has a promotion where you can get $60 credit if you buy the Kinect bundle. The Anet booth looks great (and do I spot Colin and Martin there?). Myself and two others made that booth for uncharted 3 it was the most fun at work I’ve ever had!